Yellowstone's Old Faithful Inn is a massive building within a short viewing distance of Old Faithful Geyser, the most famous geyser in the United States. The building is an exposed log and wood-frame structure of rustic design and gigantic proportions: nearly 700 feet in length and a central core seven stories high. The building was constructed in three major phases: the 1903 original section (known as the Old House) with the imposing gable roof, dining room and kitchen wings to the south, and small guest-room wings to the east and west; the 1913-14 east wing; and the 1927 west wing. The building faces north, oriented toward the old "circuit road" rather that toward the geyser. The building was designed by architect Robert Reamer. 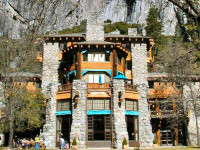 Yosemite's Ahwahnee is an enormous luxury hotel at the east end of the Yosemite Valley. Sited in a meadow, the building's large scale is diminished by the awesome beauty of the sheer granite cliffs of the north valley wall above. The building's name comes from a local Indian word meaning "deep, grassy meadow." The building is massed into several enormous blocks with a six-story central block and wings of three stories. The multiple hip and gable roofs are finished with green slate and further break up the building's form, making it appear as rough and textured as the surrounding landscape. The building has balconies and terraces at several different levels that add a spatial interest not only to the exterior but also to the visitor experiencing the interior of the building. The building contains approximately 95 guest rooms, various public spaces and meeting rooms, an enormous dining room, and utility spaces. The principal entrance to the building is through a porte-cochere on the north side of the building. The log and wood entrance contains painted decorations in Indian patterns, setting a tone for the interior. 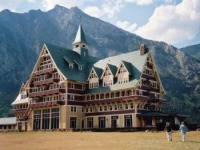 Many Glacier Hotel was built in 1914 and 1915, is the largest hotel in the Glacier National Park, Montana with 208 rooms. Its design was modeled after Swiss chalets and the Swiss theme is carried throughout the hotel, most notably in the main dining room, which features the flags of Switzerland's Cantons. 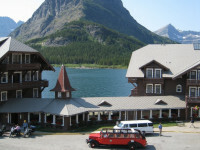 Despite its rather secluded location, Many Glacier Hotel continues to attract hundreds of tourists year after year.Its location by Swiftcurrent Lake offers excellent nature sightseeing. Visitors can come breathtakingly close to native bighorn sheep, mountain goats, and bears. The closest town to the hotel is Babb, Montana, its only 11 miles away. 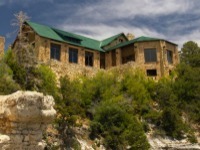 The Grand Canyon's El Tovar opened in 1905 and was most recently renovated in 2005. In the past, the Hotel has hosted such luminaries as Theodore Roosevelt, Albert Einstein, Western author Zane Grey, and many others. Today, El Tovar retains its elegant charm. Located on the Canyon rim, it features a fine dining room (open for breakfast, lunch, and dinner), lounge and curio shop with newsstand. El Tovar offers its guests Concierge, turn-down and room service and is a Registered National Historic Landmark. 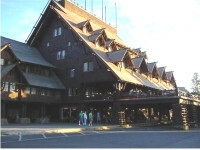 Crater Lake Lodge was built to encourage tourism to Crater Lake National Park and southwestern Oregon. It opened to guests during the summer of 1915. Its clientele has included people from all over the world. Most guests have had fond remembrances of their stays, even though the lodge was often in an unfinished state. Throughout its history the lodge lacked expected hotel standards for comfort, privacy, and service, and suffered from neglect. In the spring of 1989, just before the lodge was to open for the summer season, the engineers advised the park that the Great Hall wing was unsafe for occupants. They predicted this part of the building might collapse of its own weight, bringing down the rest of the lodge with it. 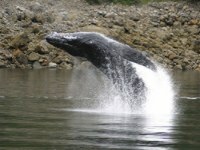 This compelled the National Park Service to keep the lodge closed and begin a comprehensive rehabilitation project. 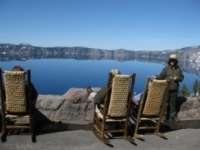 On May 20, 1995, Crater Lake Lodge reopened to the public. Patrons and visitors could again enjoy its accommodations and services safely, and in an atmosphere reminiscent of the 1920s. 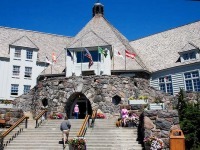 For the first time since its original opening eighty years before, Crater Lake Lodge was a project finally completed. 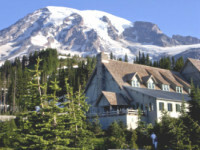 Paradise Inn at Mount Rainier National Park is among the finest and oldest mountain resorts in the Northwest, Paradise Inn is the handiwork of Stephen Mather, first director of the NPS. This historic guest lodge features 118 guest rooms, the Paradise Inn Dining Room, Glacier Lounge, and gift shop offering Native American crafts. In 1919, Hans Fraehnke, a German carpenter, designed and built much of the decorative woodwork that exists today, including a rustic piano and a 14 foot grandfather clock. Park information and historical displays can be seen at the Longmire Museum or the visitor centers at Ohanopecosh, Sunrise, and Paradise. Both elegant and organic, Timberline Lodge is a remarkable example of Depression-era public works projects. Stained a soft gray, with a central peak that echoes the outline of Mt. Hood, the building seems a natural extension of the mountainside. This National Historic Landmark exists because of Emerson J. Griffith, a Portland businessman. 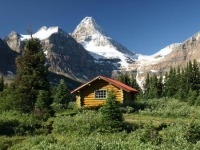 He spent a decade trying, and failing, to persuade developers to put a lodge on Mt. Hood. But then the Great Depression hit, and Griffith was named WPA Director for Oregon. His first funding request was for a "recreation project," a euphemism for the lodge he'd always wanted. In late 1935, the WPA approved the project. he would bring in "Eastern" capital to do the job. Glancing at the Chateau from the Parking lot, people see a building of 3 stories, set in a tiny and remote National Monument. On closer examination, visitors discover there are actually 6 stories to the Chateau, and that this is one of the most architecturally exciting lodges in the entire Parks system. Crossing the span of a woodland ravine, the Chateau makes exceptional use of the land's natural contours, and a stream runs through the dining room. The lodge was designed and built by local folks, with an emphasis on natural materials. 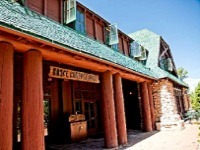 Bryce Canyon Lodge was the second structure in the Union Pacific Railway's "Loop Tours" building program. By this stage, the architect, NPS, and Railway were accustomed to working together. Even so, the Bryce Canyon development presented a few trying moments. The UP wanted to build the Lodge on the very edge of the Canyon. But the NPS refused permission. As a result, the railroad treated the Lodge as a temporary structure, to be used only until a rim site was authorized. The short-term building techniques would lead to future problems. 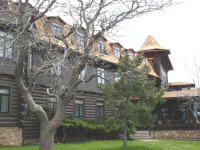 The Bryce Canyon Lodge complex was designed and built over several years, expanding in response to increased visitor demand. Two guest wings were added in 1926, and an auditorium in 1928. The Standard and Economy Cabins were finished by 1927; Deluxe Cabins were completed. The Grand Canyon Lodge would be the last major building in the Union Pacific Railway 's "Loop Tour." This was their final opportunity for an architectural statement that would create an unforgettable sense of place � and firmly cement the UP's reputation as the leader in Grand Canyon touring. The railroad's timing was impeccable. The company's other Canyon lodges were generating income. The NPS was still encouraging limited development in the National Parks. And the architect was in his prime. The resulting Grand Canyon Lodge was a work of genius, blending so beautifully into the landscape that it almost seemed part of the Canyon. The name "Zion" means a place of peace and refuge. As a sanctuary with over 146,000 acres of cliffs, canyons, diverse plant and animal life, and uninterrupted beauty, Zion is well-named. Its massive sandstone walls, some as high as 3,800 feet, offer an opportunity for serenity and reflection for all who visit. Designed by Gilbert Stanley Underwood in the 1920s, the Zion Lodge was destroyed by fire in 1966. 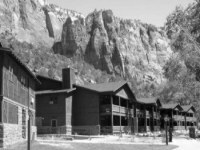 That same year, the lodge was rebuilt in 100 days, quickly restoring the influx of visitors to Zion, but sacrificing the hotel's rustic design. 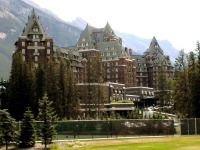 In 1990, the exterior was restored to its original classic appearance. 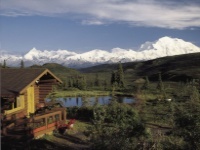 The lodge features historic cabins with two double beds, full bath, gas log fireplace and private porch. Motel rooms are also available, most with queen-size beds and some with a king-size bed, full bath and private porch or balcony. All rooms feature air conditioning, phones, radio alarm clocks and hairdryers. The lodge is open year-round, featuring special winter rates and packages December through mid-March. Red Rock Grill, Zion Lodge's recently renovated dining room, boasts spectacular views of the magnificent surroundings. Reservations are required. Casual, outdoor dining can be found at the seasonal Castle Dome Cafe, which offers relaxed seating and park fare favorites. 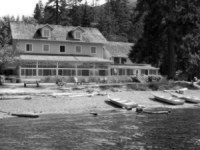 Historic Lake Crescent Lodge, built in 1916 as "Singers Tavern" in Olympic National Park serves as an ideal base camp for the variety of recreational activities in the park while allowing you to experience the charm of a turn-of-the-century resort. The comfortable, spacious guest rooms are nestled among the giant fir and hemlock trees on the shore of beautiful Lake Crescent and offer wonderful views of the lake. The simple elegance of yesteryear in the antique furnished lobby is conducive to relaxation as you unwind by the stone fireplace and the wicker-cozy sun porch is the perfect spot for enjoying a spectacular sunset over the lake. A variety of guest rooms are available at Lake Crescent Lodge, including the historic lakeside Roosevelt Cottages, to make your Olympic adventure exciting but restful. Explore the wonders of Olympic National Park while enjoying the comforts and traditional hospitality of this Historic Lodge.